Your application can tolerate non-sequential auto-increment values. If above requirements are met, you can have a pretty safe multi-node write cluster without the need to split the writes on multiple masters (sharding) as you would need to do in a MySQL Replication setup because of slave lag problems. Furthermore, having load balancers between the application and database layer can be very convenient where load balancers may assume that all nodes are equal and no extra configuration such as read/write splitting and promoting a slave node to a master are required. Note that if you run into deadlocks with Galera Cluster, you can send all writes to a single node and avoid concurrency issues across nodes. Read requests can still be load balanced across all nodes. HAProxy stands for High Availability Proxy, it is an open source TCP/HTTP-based load balancer and proxying solution. It is commonly used to improve the performance and availability of a service by distributing the workload across multiple servers. Over the years it has become the de-facto open source load balancer, is now shipped with most mainstream Linux distributions. As for this test, we were using HAproxy version 1.4 deployed via ClusterControl. IPVS implements transport-layer load balancing, usually called Layer 4 LAN switching, as part of the Linux kernel. IPVS is incorporated into the Linux Virtual Server (LVS), where it runs on a host and acts as a load balancer in front of a cluster of servers. We chose Keepalived, a load balancing framework that relies on IPVS to load balance Linux based infrastructures. Keepalived implements a set of checkers to dynamically and adaptively maintain and manage a load balanced server pool according their health. High availability and router failover is achieved by VRRP protocol. When MySQL Proxy was born, it was a promising technology and attracted quite a few users. It is extensible through the LUA scripting language, which makes it a very flexible technology. MySQL proxy does not embed an SQL parser and basic tokenization was made through LUA language. Although MySQL Proxy has been in alpha status for a long time, we do find it in use in production environments. 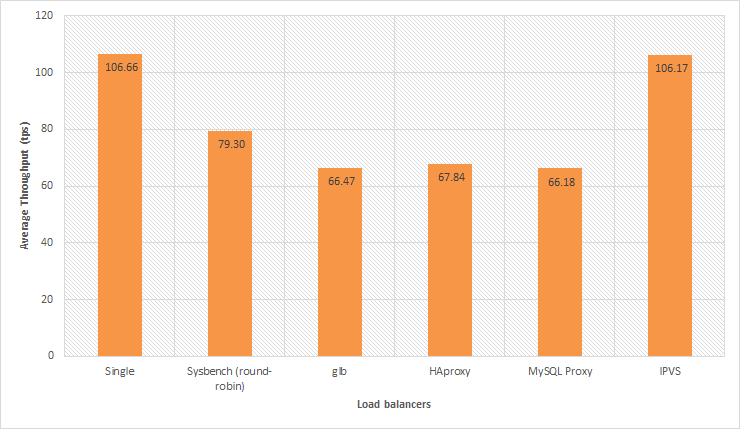 The command above was repeated 100 times on each load balancer including one control test as baseline where we specified a single MySQL host for sysbench to connect to. 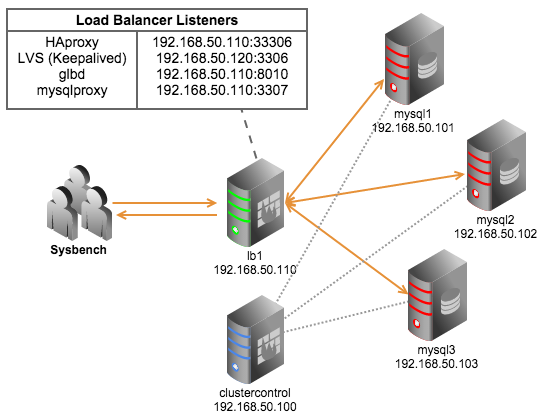 Sysbench is also able to connect to several MySQL hosts and distribute connections on round-robin basis. We included this test as well. The physical host’s CPU constantly hit 100% throughout the test. 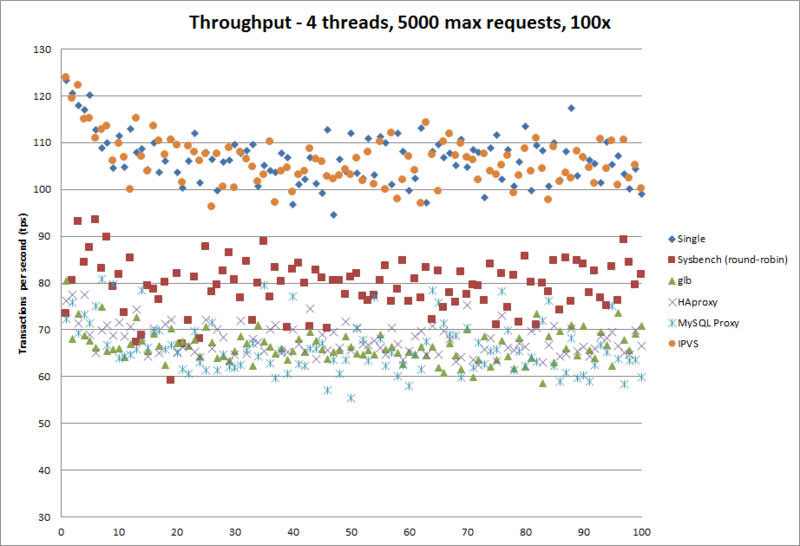 This is not a good sign for proxy-based load balancer since they need to fight for CPU time. A better test would be to run on an bare metal servers, or isolate the load balancer host on a separate physical host. The results obtained from this test are relevant only if you run in a virtual machine environment. Unlike IPVS which is similar to a router, proxy-based load balancers (glb, HAproxy, MySQL Proxy) operate on layer 7. It can understand a number of backend servers protocol and able to do packet-level inspection, protocol routing and is far more customizable. Proxy-based load balancers operate on application level, and is easier to configure them with firewalls. However, they are significantly slower. IPVS on the other hand, is pretty hard to configure and can be confusing to deal with especially if you running on NAT where your topology has to be setup so that your LVS load balancer is also the default gateway. Since it is part of the kernel, upgrading LVS might mean kernel change and reboot. Take note that the director and realservers can't access the virtual service, you need an outside client (another host) to access it. So LVS has an architecture impact, if you run on NAT, client and servers cannot run in the same VLAN and subnet. It is only a packet forwarder, and therefore is very fast. If you need to balance solely on number of connections or your architecture is running on a CPU-bound environment, the layer 4 load balancer should suffice. On the other hand, if you want to have a more robust load balancing functionality with simpler setup, you can use the proxy-based load balancer like HAproxy. Faster doesn’t mean robust, and slower doesn’t necessarily mean it is not worth it. In a future post, we plan on looking at MaxScale. Let us know if you are using any other load balancers.